The Institute of Fluorescence is proud to be the home to several annual book serials including: The Who's Who in Fluorescence Annual Volume, the annual Reviews in Fluorescence, the annual Reviews in Plasmonics and the Topics in Fluorescence Spectroscopy series. The volumes are edited volumes by Dr. Chris Geddes, with leading edge contributions made to the volumes from authors around the world. Each year, the Institute of Fluorescence publishes several volumes in each of these serials. The Institute of Fluorescence is home to both the Reviews in Fluorescence (RIF), and Reviews in Plasmonics (RiP) annual hard bound book serials. The RIF and RIP serve as comprehensive collections of trends and emerging hot topics in the fields of both Fluorescence and Plasmonics respectively. Both volumes summarize the year's progress in the respective fields, with authoritative analytical reviews, specialized enough to be attractive to professional researchers, yet also appealing to the wider audience of scientists in related disciplines of Fluorescence and Plasmonics. To date several yearly volumes have been published with invited chapters from authors all over the world. The volume is readily available on Amazon.com as well as other internet book sites. The hard bound volumes are published in March annually and are typically 450 printed pgs. 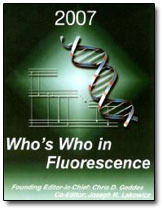 Dr. Geddes is the founding Editor-in-Chief of the world renown "Who's who in Fluorescence annual volume" (WWIF). With over 20,000 copies disseminated around the world to date, the WWIF serves as a comprehensive archive of fluorescence workers interests, contact details and specialty keywords. Entry into the volume is limited and dependent on academic achievements, such as publications etc, in the research areas of fluorescence and biomedical sensing. The WWIF volume recently introduced a new personal publication statistic into the volume. Similar to Thompson ISI journal impact numbers, the AIM number (Author Impact Measure) calculates author's individual publication statistics for any given year. The volume is published in March of each year, approximately 220 printed pgs, soft bound. To date, 11 books have been published in this edited volume series with contributions from many authors from around the world. The latest volume, Volume 11, "Glucose Sensing" was published in 2006. This hard bound volume was founded in 1981 and has long since been a popular series for Fluorescence workers. "Radiative Decay Engineering" – Topics in Fluorescence Spectroscopy Volume 8, Edited by Chris D. Geddes and Joseph R. Lakowicz, Springer, New York, 2004. ISBN – 0-387-22662-1. "Advanced Concepts in Fluorescence Sensing: Small molecule Sensing" - Topics in Fluorescence Spectroscopy Volume 9, Edited by Chris D. Geddes and Joseph R. Lakowicz, Springer, New York, 2005. ISBN – 0387233342. "Advanced Concepts in Fluorescence Sensing: Macromolecular Sensing" – Topics in Fluorescence Spectroscopy Volume 10, Edited by Chris D. Geddes and Joseph R. Lakowicz, Springer, New York, 2005. ISBN – 0387236449. 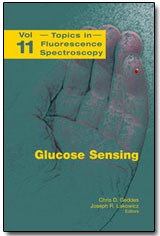 "Glucose Sensing" - Topics in Fluorescence Spectroscopy Volume 11, Edited by Chris D. Geddes and Joseph R. Lakowicz, Springer, New York, 2006. ISBN – 0-387-29571-2. The Institute of Fluorescence is Home to the Majority of Peer-Reviewed Fluorescence Journals and Book Serials in the World Today. The Journal of Fluorescence, an international forum for the publication of peer-reviewed original artic les that advance the practice of this established spectroscopic technique. 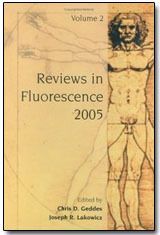 Topics covered by the Journal of Fluorescence include: advances in theory/and or data analysis, studies of the photophysics of aromatic molecu les, solvent, and environmental effects, development of stationary or time-resolved measurements, advances in fluorescence microscopy, imaging, photobleaching/recovery measurements, and/or phosphorescence for studies of cell biology, chemical biology and the advanced uses of fluorescence in flow cytometry/analysis, immunology, high throughput screening/drug discovery, DNA sequencing/arrays, genomics and proteomics. Typical applications might include studies of macromolecular dynamics and conformation, intracellular chemistry, photon migration in tissues and gene expression. 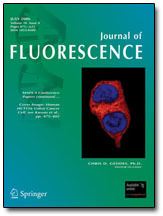 The Journal of Fluorescence publishes 6 times yearly, with approximately 1000-pages of material published annually by Springer. The Journal of Fluorescence is Abstracted or indexed in Chemical Abstracts, Chemistry Citation Index, Index Medicus/MEDLINE, INSPEC Information Services, Science Citation Index, Science Citation Index Expanded and the ISI alerting service. The Journal of Fluorescence 2006 Impact factor is 2.601 and has rapidly been climbing over the last 5 years. - View this journal online at Springer. 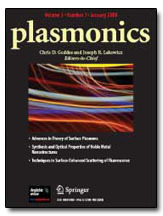 The Institute of Fluorescence is also the home for Plasmonics, a fairly new Springer Journal launched in 2006. Plasmonics is an international forum for the publication of peer-reviewed leading-edge original artic les that both advance and report our knowledge base and practice of the interactions of free-metal electrons, plasmons. Topics covered include notable advances in the theory, physics, and applications of surface plasmons in metals, to the rapidly emerging areas of nanotechnology, biophotonics, sensing, biochemistry and medicine. Topics, include the theory, synthesis and optical properties of noble metal nanostructures, patterned surfaces or materials, continuous or grated surfaces, devices, or wires for their multifarious applications. Plasmonics publishes papers that describe new plasmonic based devices, new synthetic procedures for the preparation of nanostructures and their optical properties, as well their applications in analytical sensing.